﻿﻿﻿His name is Bond...James Bond. His favourite drink is Martini ‘shaken, not stirred’ and he is constantly surrounded by beautiful women called the ‘Bond girls’. Since half a century James Bond has been one of the most iconic and adulated spies in the world. He works for her Majesty’s Secret Service under the code name of agent 007(double o seven). During his secret missions, he has to defeat evil villains, who represent a threat for Great Britain and the world. Despite the fact that he doesn’t always follow the orders of MI6, his superiors, he always manages to achieve his goals and save the world thanks to his unexpected whizzy gadgets but also his temerity. The character of James Bond was brought to life in 1953 by the writer Ian Fleming, himself an ex-officer of the naval intelligence during World War II, and appeared for his first adventure in the novel “Casino Royale”. It will be followed by thirteen other novels, many of them adapted into films. James Bond is a spitting image of the perfect British gentleman: handsome, strong, educated, sophisticated and not lacking in self-confidence. No matter the situation he’s involved in, he always looks his best in his sharp suits. Even between two killings he finds the time to go to the casino and with his charm and charisma he never fails in seducing attractive ladies. Those who played the spy also contributed to his success. Except George Lazenby and Pierce Brosnan (respectively Australian and Irish), they are all British actors. Sean Connery, the Scottish, was the first to play the role in Dr No in 1962. He was followed by George Lazenby in 1969, Roger Moore in 1973, Thimothy Dalton in 1987, Pierce Brosnan in 1995 and finally Daniel Craig in 2006. His looks, personality but also his luxury cars are representative of the British icon. 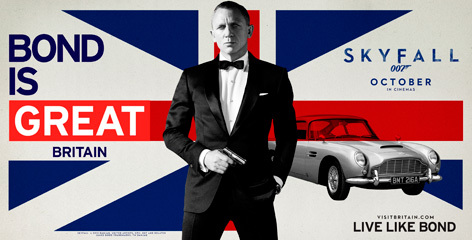 Thanks to the Bond movies, British cars have been promoted all around the world. Famous British makes such as Aston Martin, Rolls Royce, Jaguar, Bentley have seen their popularity rocketing. Moreover, both in the movies and in the novels, numerous emblematic English places are highlighted. For example, Buckingham Palace appears in the movie Die Another Day, Edinburgh's Fettes College in the novel You Only Live Twice. Yet, it is the latest film Skyfall that is the most largely based in London with scenes shot by Big Ben, St Paul’s Cathedral and in the Tube. The most striking elements showing how deeply James Bond is rooted in British culture are that the Queen herself is a fan and has attended three of the movie premieres. Most recently, she took part in a film for the 2012 Olympics opening ceremony in which she was escorted by Daniel Craig, the latest James Bond. For 50 years thus, James Bond has been a great example of ‘pure Britishness’. Quotes of the movies are even now common knowledge and it will be a long time before we stop saying: ‘My name is Bond...James Bond’.